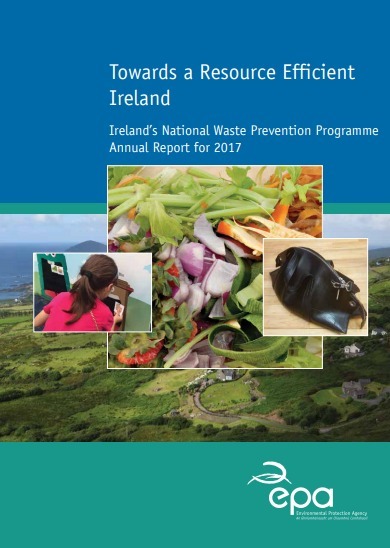 “The National Waste Prevention Programme delivers initiatives and supports to promote Ireland’s transition to a low-carbon, circular economy and provide leadership on national priorities such as food waste prevention. In 2017, €1.8 million was invested in resource efficiency and the sustainable use of resources in Ireland.” Dr Eimear Cotter, Director of the EPA’s Office of Environmental Sustainability, was speaking at the release of the report, Towards a Resource Efficient Ireland: Annual Report for 2017. Ireland’s National Waste Prevention Programme supports homeowners, businesses and other sectors to prevent waste and use resources more efficiently. “By being clever about what we make and being careful about how we use the goods and services in our lives, we can save raw materials and reduce waste while maintaining a good lifestyle. The EPA provides leadership across a range of activities by identifying innovative practices and supports. To give two examples, the Stop Food Waste programme supported 300 households in 2017 to reduce food waste as part of its Stop Food Waste Challenges while the Smart Farming programme delivered average cost savings of €5,000 for 38 farmers. This was achieved through improvements in on-farm efficiency that also resulted in reduced greenhouse gas emissions by 5-7 per cent. The National Waste Prevention Programme is a Government of Ireland initiative. The report can be found on the EPA website. Ireland’s Food Waste Charter signed and launched. 300 households completed Stop Food Waste Challenges. 21 local authorities were funded to run 34 community waste prevention initiatives. €1.3 million in savings identified through Greenbusiness.ie. 260 businesses used the online Tool for REsource Efficiency (TREE). 3,000 tonnes of materials reused through SMILE Resource Exchange. 150 of Ireland’s largest water users collaborated on water saving. Case Studies and Best Practice Guidance for hospital waste use were published. 38 Smart Farmers saved costs, reduced greenhouse gas emissions and shared their experiences. 2,400 farmers safely disposed of 177 tonnes of hazardous wastes. Over 10,000 items exchanged on FreeTrade Ireland. www.repairmystuff.ie developed to promote local repair services. National Waste Prevention Committee . The NWPP has been operating since 2004 and delivers a suite of initiatives and supports to reduce wasteful consumption of material, water and energy resources by changing behaviours in businesses, households and the public sector. For businesses, it seeks to enhance competitiveness and reduce business costs by delivering programmes that stimulate resource efficiency and the circular economy. “Towards a Resource Efficient Ireland” is a National Strategy to 2020 which incorporates Ireland’s National Waste Prevention Programme and has the vision of Living Better, Using Less. EU Action Plan for the Circular Economy that establishes a concrete and ambitious programme of action, with measures covering the whole cycle: from production and consumption to waste management and the market for secondary raw materials and a revised legislative proposal on waste.